Over the last five years, disbursements to the construction and mining equipment sector have grown at a CAGR of 5.9 per cent. Devendra Kumar Vyas, CEO, Srei Equipment Finance, shares more on the current trends and future growth prospects in equipment financing. Could you elaborate on your company and its core competencies? We are the leading financiers in the construction, mining, and allied equipment (CME) sector in India for fiscal 2017 (Source: Feedback Analysis). This sector primarily consists of equipment used for earthmoving and mining, concreting, road building, material handling, material processing and allied activities. Our product offerings include loans for new and used equipment, and leases. We provide equipment financing solutions across the CME value chain, i.e. from asset acquisition through to deployment, management and resale of the asset, and managing the customer relations across the entire asset lifecycle. The equipment-centric services we provide include preferred financing schemes offered by us in conjunction with original equipment manufacturers (OEMs), equipment deployment assistance during project downtime, spare parts financing, exchange program financing and used equipment financing. In addition to CME, we have also diversified into financing of tippers, IT and allied equipment, medical and allied equipment, farm equipment and other assets (finance/lease of industrial and other non-CME equipment). What is your market share in India in equipment financing? Srei Equipment Finance (SEFL) leads the CME finance market with a market share of approximately 32.7 per cent in fiscal 2017. Since our inception, we have been CME financiers. Our long track record in this vertical has helped us develop deep knowledge on infrastructure sector, understanding of equipment lifecycle and strong relationships with borrowers. This helps us access new potential borrowers, provide customised solutions and manage asset risks prudently. We have demonstrated clear market differentiation through our holistic approach to providing equipment financing solutions. This approach covers the value chain in the equipment lifecycle by providing financing to and sustaining continuous engagement with customers across equipment procurement, deployment, maintenance, second life financing, and exit stages. Do you provide financing to used equipment? What are the criteria for this? We have been providing financing for used equipment to our retail and SME customers. Used equipment financing is provided for a wide range of CME equipment. What are the new market opportunities you foresee in equipment finance? Do you see any major challenges? Going forward, revolutionary trends appear to be emerging in the equipment financing sector. There is likely to be increased presence of integrated offerings wherein dealers and OEMs are expected to offer customers integrated choice, which will include the equipment finance (and could also cover the lifecycle financing of the equipment). Currently, equipment financing takes anywhere between 5-30 days before the machine is handed over to the customer. Equipment financing companies need to move to the automation route, to sustain and survive in this technology-led market. A major differentiator could be transparency with a process to manage documentation, including, for example, EMI payments. Further, at present, there are a few companies which provide a platform for equipment owners and customers to interact and avail of equipment services. This is more like the 'Uberisation' of the equipment industry. This could be a good opportunity for finance companies to participate and ensure that all finance needs are met. Lastly, managed services are another area that is emerging. Customer demand for greater flexibility and convenience will augment the use of non-standard financing agreements. Shifts in customer preference for managed services (bundling equipment, services, supplies and software), pay-per-use leases and alternative financing will encourage equipment finance companies to find innovative ways to meet the demand. 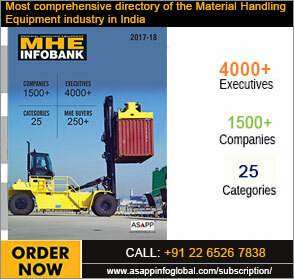 One of the challenges that we foresee for the construction equipment financing market in India is that it is still in its development stage and continues to face various issues which act as a deterrent to growth including lack of access to finance, unfavourable regulations and higher non-performance assets (NPAs) among lenders. First-time buyers (FTBs) are prone to high margin requirements (nearly 20-30 per cent) and shorter payback periods. There is also a need for a proper registration process for all construction equipment (including off-road equipment), which will help to develop and sustain the organised used equipment market and assist with calculation of the residual value of equipment on resale. How are you experiencing the growth of construction equipment finance in India? Where do you see the market in 2020? The infrastructure sector is a key driver for the Indian economy and is largely responsible for propelling India's overall development. The government is focusing on initiating policies to ensure the creation of a world-class infrastructure in India. The government's initiative to improve infrastructure in India has caused a surge across all segments with a special focus on roads and highways sector. This has led to increased demand for road construction equipment, thereby increasing the disbursement to the segment. Government focus on building concrete roads (on national and state highways) has boosted the demand for concrete and material processing equipment, though the slowdown in the real estate sector continues. The CME sector experienced a period of de-growth from fiscal 2013 until September 2015, followed by a period of flat growth between October to December 2015. Sales picked up from January 2016 and continued to grow until November 2016. The industry witnessed a slight reduction in sales numbers during December 2016 due to demonetisation and reduction in retail sales. The growth rate then increased by 7 per cent during the fourth quarter of fiscal 2017 as compared to the third quarter of the fiscal 2017. The industry has witnessed a good revival in the last two financial years following the decline in the previous three years. The total CME finance disbursement for fiscal 2017 was estimated to be approximately Rs 280 billion. Over the last five years, disbursements to the sector have grown at a CAGR of 5.9 per cent. During the recovery period of fiscal 2015 to fiscal 2017, the industry grew at a rate of 19.8 per cent. 68-70 per cent of the overall CME finance market. Banks and NBFCs are expected to have an equal share in the CME finance industry for the next one to two years with the equipment leasing industry expected to grow at a CAGR of 26 per cent for the next three years.